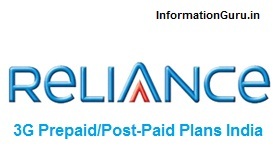 Reliance slashes its 3G Plans upto 50%, lowest plan is start from just Rs.123; which you can Activate on your Mobile Phone / Dongle: Find out all the changed Prepaid and Postpaid 3G Data Internet Packs for year 2014. Reliance 3G Postpaid Plans In Delhi Unlimited is available to all subscribers at an unrestricted speed upto 21 Mbps. Use your 3G phone as a modem by connecting it to your PC/laptop. You can also insert your Reliance 3G SIM into a Reliance 3G Plan and use the 3G Mobile Broadband data service.